Global indoor farming technology market expected to reach USD 15,285.22 million globally by 2024, growing at a CAGR of around 13.23% between 2018 and 2024. The decline in arable land, stress on natural resources, and limited external weather conditions are some of the key factors estimated to support the indoor farming technology market growth. The report analyzes and forecasts the indoor farming technology market on a global and regional level. The study offers past data from 2014 to 2017 along with forecast from 2018 to 2024 based on revenue (USD Million). Assessment of indoor farming technology market dynamics gives a brief thought about the drivers and restraints for the indoor farming technology market along with the impact they have on the demand over the years to come. Additionally, the report also includes the study of opportunities available in the indoor farming technology market on a global level. The report gives a transparent view of the indoor farming technology market. We have included a detailed competitive scenario and portfolio of leading vendors operative in the indoor farming technology market. The report also covers patent analysis with bifurcation into a patent trend, patent by the company, and patent by region. The study encompasses a market attractiveness analysis, wherein components, type, and end-user industry segments are benchmarked based on their market size, growth rate, and general attractiveness. The report provides company market ranking analysis in order to give a broader overview of the key players in the market. In addition, the report also covers key strategic developments of the market including acquisitions & mergers, new product launch, agreements, partnerships, collaborations & joint ventures, research & development, product and regional expansion of major participants involved in the market on a regional basis. Furthermore, the report studies the major analysis along with the regulatory landscape for the indoor farming technology market. 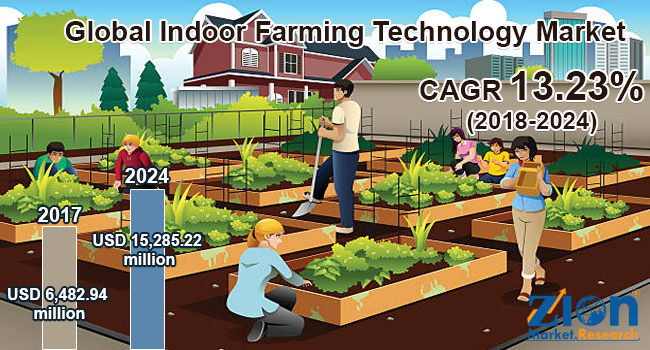 The study provides a crucial view of the indoor farming technology by segmenting the market based on the growing system, components, facility type, and other crop types, and region. All the segments of indoor farming technology market have been analyzed based on present and the future trends and the market is estimated from 2018 to 2024. The global indoor farming technology market is divided into the growing system, components, facility type, and other crop types. Hydroponics, aeroponics, aquaponics, soil-based, and hybrid are the growing system segment of the market. Components segment of the global indoor farming technology market is segmented into hardware and software & services. Glass or poly greenhouses, container farms, indoor vertical farms and indoor deep water culture (DWC) systems are the segment based on facility type. Furthermore, based on crop type, the market is segmented into fruits & vegetables, herbs & microgreens, flowers & ornamentals, and others crop type. The competitive profiling of noticeable players of indoor farming technology market includes company and financial overview, business strategies adopted by them, their recent developments and product offered by them which can help in assessing competition in the market. Noticeable players included in the report are Philips Lighting, Netafim, Everlight Electronics, Certhon, Logiqs B.V, Urban Crop Solutions Argus Controls Systems, and Illumitex, amongst others.